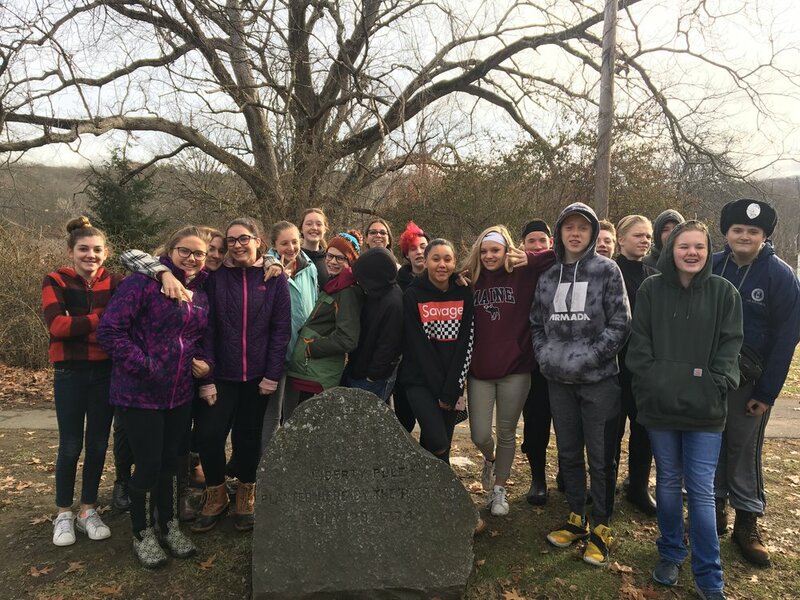 8th grade students were invited to join a learning excursion to Historic Deerfield, Massachusetts. In the classroom, they have been learning about colonial communities and the prelude to the American Revolution. They've spent weeks reading and reviewing primary and secondary sources that tell the story of our emerging republic. On Wednesday they had the opportunity to see many of themes they've learned about in real life. Students had a walking tour of the historic village, learned about class and status in a colonial community, and saw the term "neighbor against neighbor" in context. They had a tour of the Ashley House (Mr. Ashley was a Loyalist minister in Deerfield) and they had a handwriting lesson at the old school house using ink and real goose feathers! We rounded out the trip with a tea experience in the Grand Ballroom of one of Deerfield's historic homes. While the tea service was underway, small groups of students (4-5 at a time) went to the Olde Hearth Kitchen to make their own Liberty Tea from dried herbs from the kitchen garden. Students represented Windsor well and were fully engaged in the learning experience. Students will be creating photo essays and mini documentaries detailing the highlights of the day. Finished products will be posted to their e-portfolios and will be showcased in the Spring as part of our exhibition of learning.